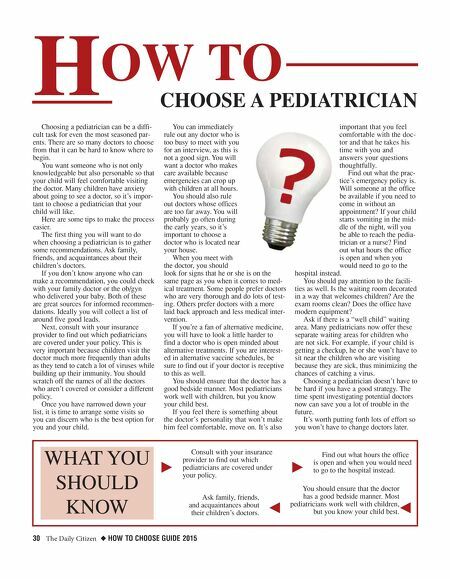 30 The Daily Citizen ◆ HOW TO CHOOSE GUIDE 2015 Choosing a pediatrician can be a diffi- cult task for even the most seasoned par- ents. There are so many doctors to choose from that it can be hard to know where to begin. 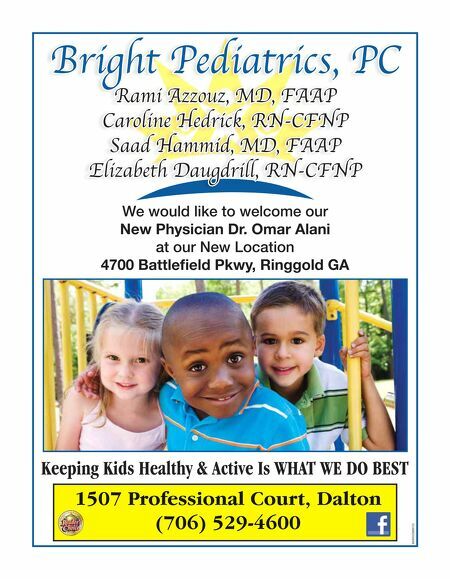 You want someone who is not only knowledgeable but also personable so that your child will feel comfortable visiting the doctor. Many children have anxiety about going to see a doctor, so it's impor- tant to choose a pediatrician that your child will like. Here are some tips to make the process easier. The first thing you will want to do when choosing a pediatrician is to gather some recommendations. Ask family, friends, and acquaintances about their children's doctors. If you don't know anyone who can make a recommendation, you could check with your family doctor or the ob/gyn who delivered your baby. Both of these are great sources for informed recommen- dations. Ideally you will collect a list of around five good leads. Next, consult with your insurance provider to find out which pediatricians are covered under your policy. This is very important because children visit the doctor much more frequently than adults as they tend to catch a lot of viruses while building up their immunity. You should scratch off the names of all the doctors who aren't covered or consider a different policy. Once you have narrowed down your list, it is time to arrange some visits so you can discern who is the best option for you and your child. You can immediately rule out any doctor who is too busy to meet with you for an interview, as this is not a good sign. You will want a doctor who makes care available because emergencies can crop up with children at all hours. You should also rule out doctors whose offices are too far away. You will probably go often during the early years, so it's important to choose a doctor who is located near your house. When you meet with the doctor, you should look for signs that he or she is on the same page as you when it comes to med- ical treatment. Some people prefer doctors who are very thorough and do lots of test- ing. Others prefer doctors with a more laid back approach and less medical inter- vention. If you're a fan of alternative medicine, you will have to look a little harder to find a doctor who is open minded about alternative treatments. If you are interest- ed in alternative vaccine schedules, be sure to find out if your doctor is receptive to this as well. You should ensure that the doctor has a good bedside manner. Most pediatricians work well with children, but you know your child best. If you feel there is something about the doctor's personality that won't make him feel comfortable, move on. It's also important that you feel comfortable with the doc- tor and that he takes his time with you and answers your questions thoughtfully. Find out what the prac- tice's emergency policy is. Will someone at the office be available if you need to come in without an appointment? If your child starts vomiting in the mid- dle of the night, will you be able to reach the pedia- trician or a nurse? Find out what hours the office is open and when you would need to go to the hospital instead. You should pay attention to the facili- ties as well. Is the waiting room decorated in a way that welcomes children? Are the exam rooms clean? Does the office have modern equipment? Ask if there is a "well child" waiting area. Many pediatricians now offer these separate waiting areas for children who are not sick. For example, if your child is getting a checkup, he or she won't have to sit near the children who are visiting because they are sick, thus minimizing the chances of catching a virus. Choosing a pediatrician doesn't have to be hard if you have a good strategy. The time spent investigating potential doctors now can save you a lot of trouble in the future. It's worth putting forth lots of effort so you won't have to change doctors later. H OW TO CHOOSE A PEDIATRICIAN WHAT YOU SHOULD KNOW k j Consult with your insurance provider to find out which pediatricians are covered under your policy. Ask family, friends, and acquaintances about their children's doctors. k j Find out what hours the office is open and when you would need to go to the hospital instead. You should ensure that the doctor has a good bedside manner. Most pediatricians work well with children, but you know your child best.